JUST TWO WEEKS remain to pledge to our Kickstarter campaign! We've raised over $4000 now and we're halfway to our goal. We are thrilled with all the interest, and grateful to each one of you that's pledged! But we need to keep up the same momentum or better in the second half. If you haven't pledged yet, we want you to be part of this project! Without you, "White Horse" doesn't get made! We were fortunate to get to spend the first few days of our campaign making music in California, and we had a great time! We had six hugely successful shows, shared the stage with (and enjoyed the hospitality of) some great musicians like Eight Dollar Mountain (who just finished their own successful Kickstarter campaign! ), Windy Hill, David Thom, and Scott Gates. California treated us right for sure. 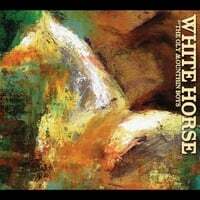 And we got some great video - if you're still on the fence about pledging to support White Horse, watch this clip that features one of our favorite tunes from the album, performed at our Saturday night show at Castoro Cellars in Templeton! The bartender’s voice startled Charlie, and it wasn’t until then that he realized he had the gun half-drawn from his pants and the hammer cocked. Charlie shook his head. He eased the hammer back into place and pried his fingers from the handle of the Colt. Charlie looked back to the doors through which the Sheriff had come, past them to the darkness outside. After looking for so long, I dreamed I finally found her in a town I couldn’t name. It felt like both my legs had been sliced clean off when she looked at me that way. It wasn’t just that the love was gone. We were just standing there in the middle of the street, a lot of distance between us. She had the kids with her. I guessed she found another man, but it wasn’t clear, we just looked at each other. Damn that look! I see it to this day, as if it really happened. See when I went to walk away, I just made the motion of walking away, but I still kept my eyes on her, and I swear I saw relief in her eyes. My legs let me leave, but they surprised me by even being there. Wherever that even was. We'll see you jammin at Wintegrass this weekend! And once again, we hope you'll pledge to our Kickstarter campaign so that we can all celebrate together at these great local Oly shows at the end of March! FRIDAY, MARCH 21st, 9pm - Royal Lounge with HILLSTOMP!, Olympia WA. SATURDAY, MARCH 29th, 10pm - Olympia Acoustic Music Festival, Olympia WA.